“ I would rather die than lose my sight.” “I don’t know how you do it, I couldn’t.” People’s biggest fear after dying is to lose their vision and go totally blind. I have pondered this for a while now, I hear it so often I think that people think it is a compliment when they say things like “you are amazing I could never do what you do”. I do not take this as a compliment. The fact that people would rather die than live a life without sight says so much about how people who are blind or partially sighted are viewed in society. Recently there was a mass killing of people with disabilities because someone thought that people with disabilities should be euthanized. Why ? I feel like there should be a more complex question that I am asking myself but I just keep coming up with why ? I have been utterly speechless for days now. It is just unbelievably horrific. I feel so much pain and sympathy for all of those that lost their lives and their families and loved ones. I have not said anything about these comments because I feel like 1. they are all ignorant uneducated people who have bigger issues than me being blind and 2. I have pretty thick skin and I do not have time for people like this. However with the lack of media coverage of the incident in Japan where so many people lost their lives simply because they had a disability, I feel like I need to speak up and show people the way others view disability. My life has no less value than yours or anyone else’s simply because I have a disability. It is not a death sentence, I am not miserable and living a horrible life. I am however; a mother, a sister, a wife, a friend, a volunteer, a writer, an advocate, successful, happy and excited about life. Now why is being blind so horrible ? 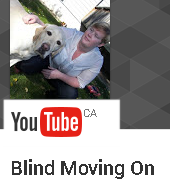 I feel like the only thing that is that bad about being blind is other people attitude towards my disability. Amen. Indeed your life matters. It matters to me when I get encouragement from your writing. Your life matters to anyone who might benefit from the encouragement I receive here and can pass along. Life is not measured in eyes, legs, or energy levels. Life is measured in the flow of love amongst ourselves. Thanks for sharing.